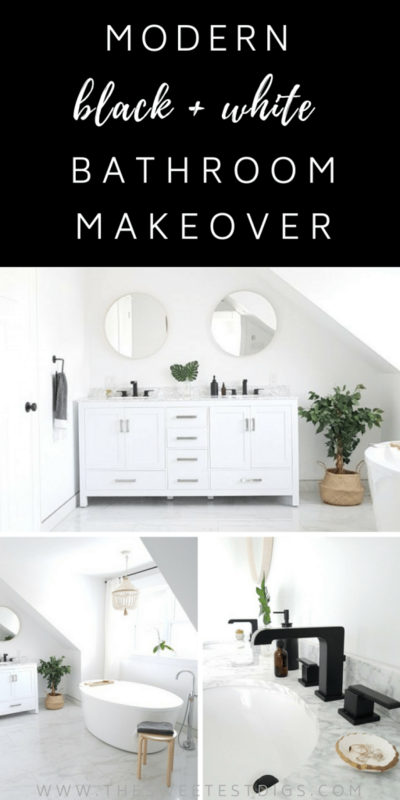 I’m revealing our modern marble bathroom makeover. This room was a long-time coming. 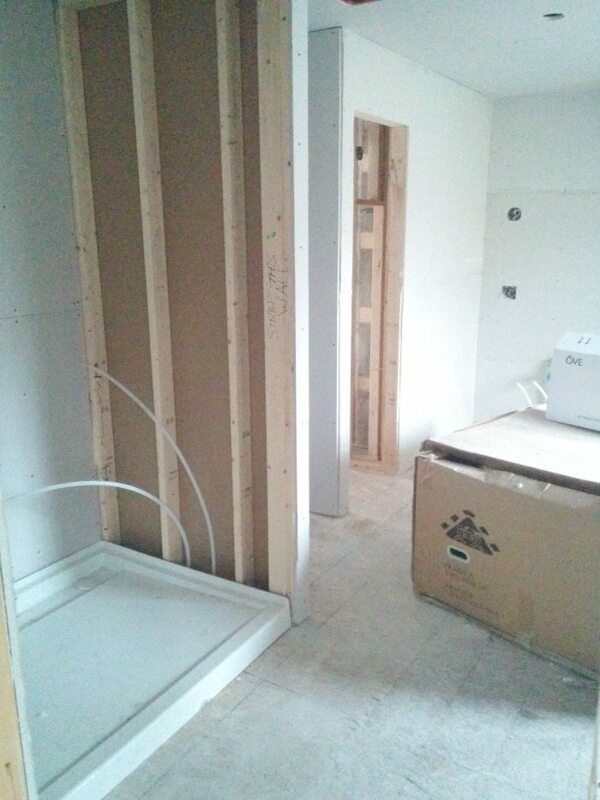 It sat unfinished for two years after our house renovation, waiting until we had the funds and time to tackle it. I’m pretty pumped with how it all came together. 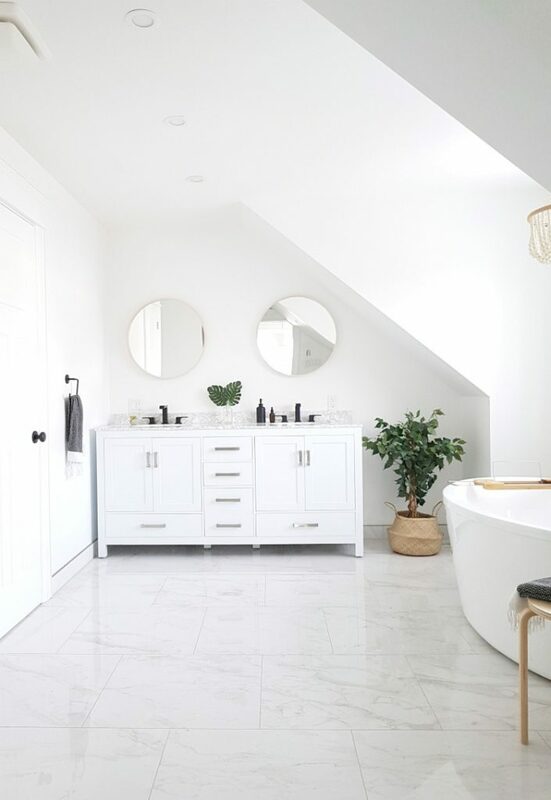 This whole design is absolutely a lesson in how to get a majorly luxe look but with big box store purchases and budget-friendly items. No interior designer or hugely deep pockets for custom pieces required. 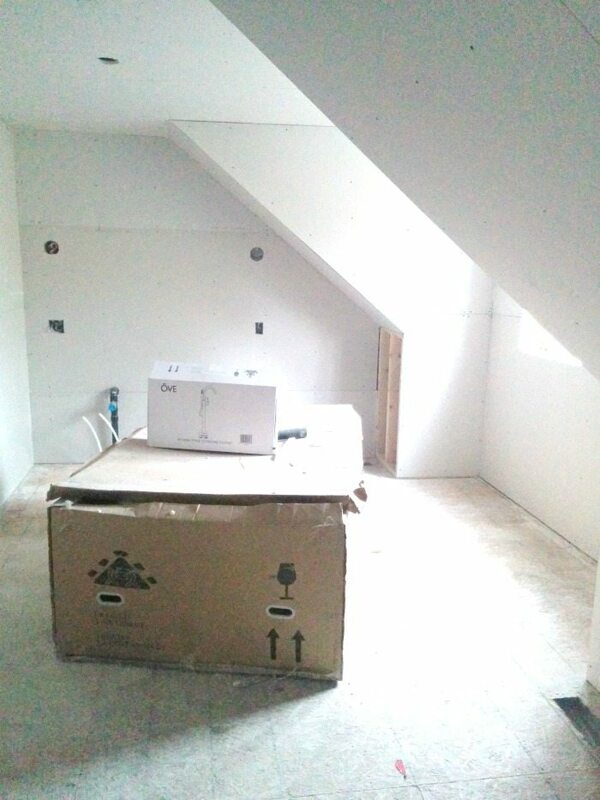 One big, completely unfinished space. White on white. Crisp, beautiful, fresh. 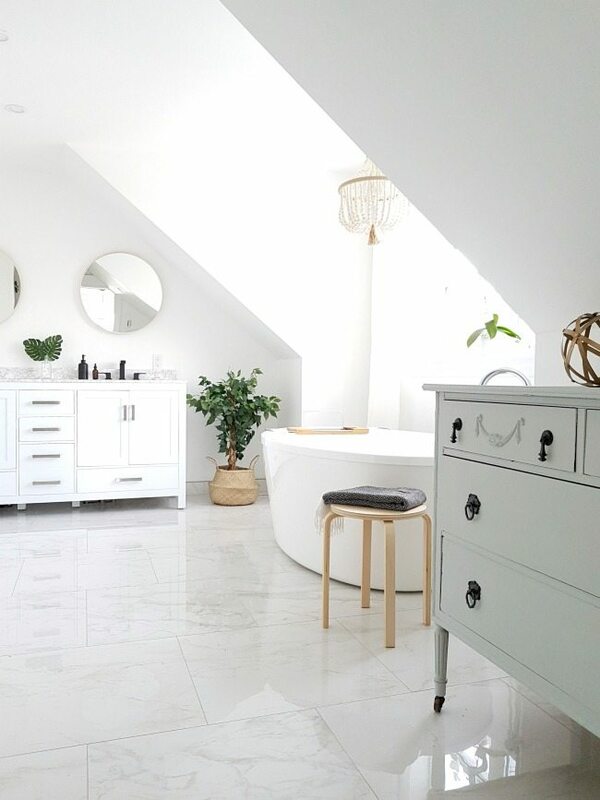 I really can’t get enough of this room – it’s my fave in the whole house. 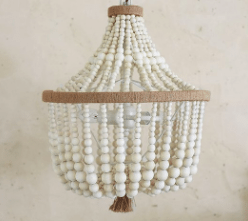 Scroll to the bottom for all the source links (like that gorgeous pendant from Pottery Barn!!). 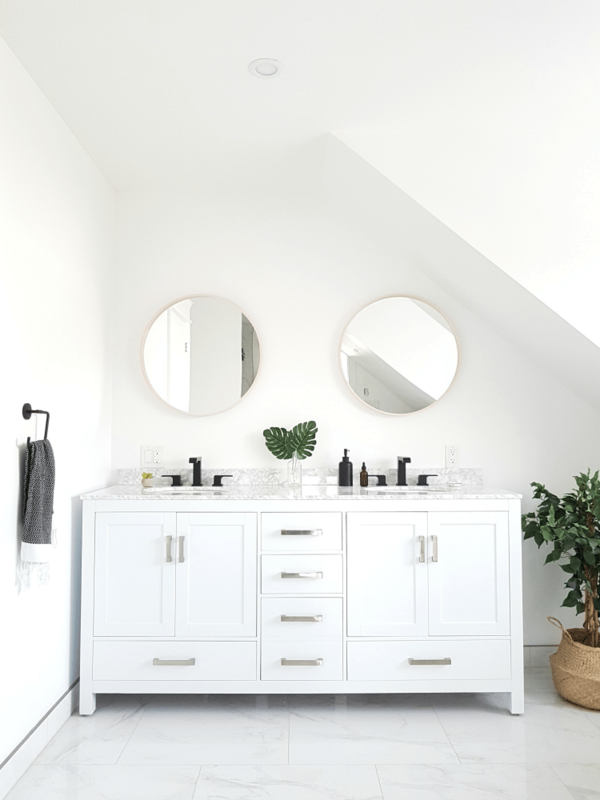 The ‘Sheffield’ double vanity from Home Depot was the starting off point for the room – the first piece we chose – and it totally delivered. Quality craftsmanship, a tailored classic look, and a really good bang for your buck. To me, it looks like a custom piece, but it’s actually just off the shelf. 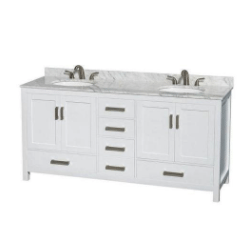 It even comes with all the chrome hardware, genuine marble countertop, and sinks. Amazing value! 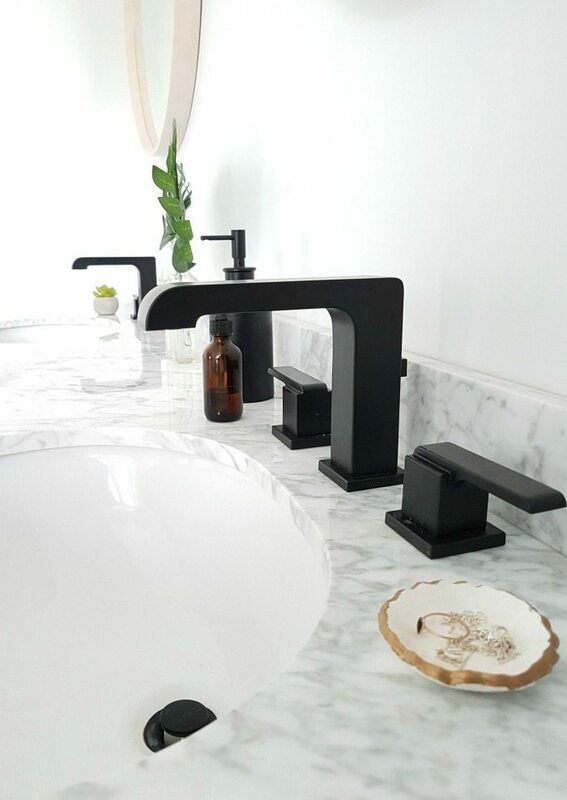 Paired with the matte black ‘Ara’ collection from Delta Faucets, it’s a total match made in heaven. 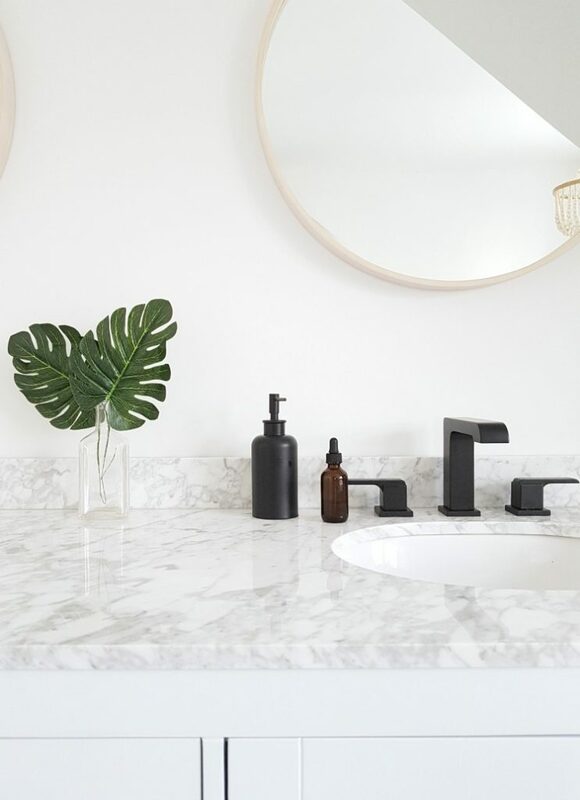 I’m obsessed with how well the black goes with the marble countertops, while the light wood mirrors and greenery brings some warmth to the space. 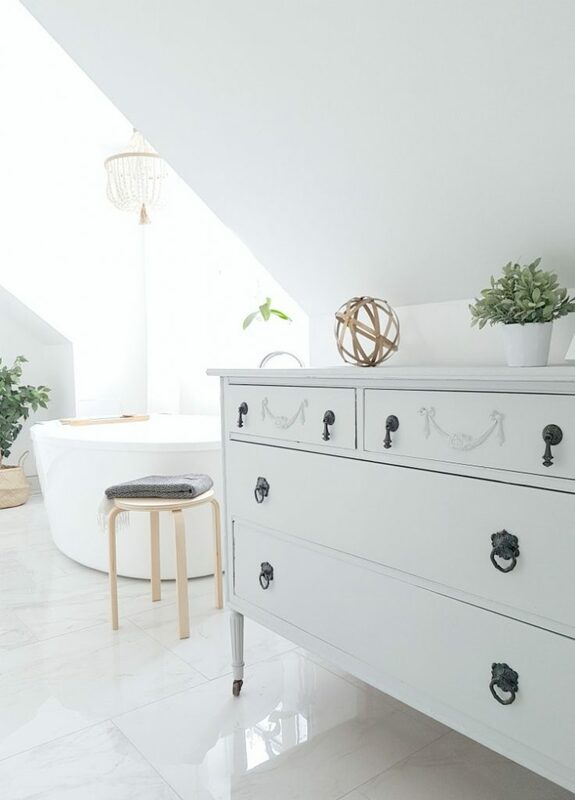 We kept things pretty minimal throughout the room. 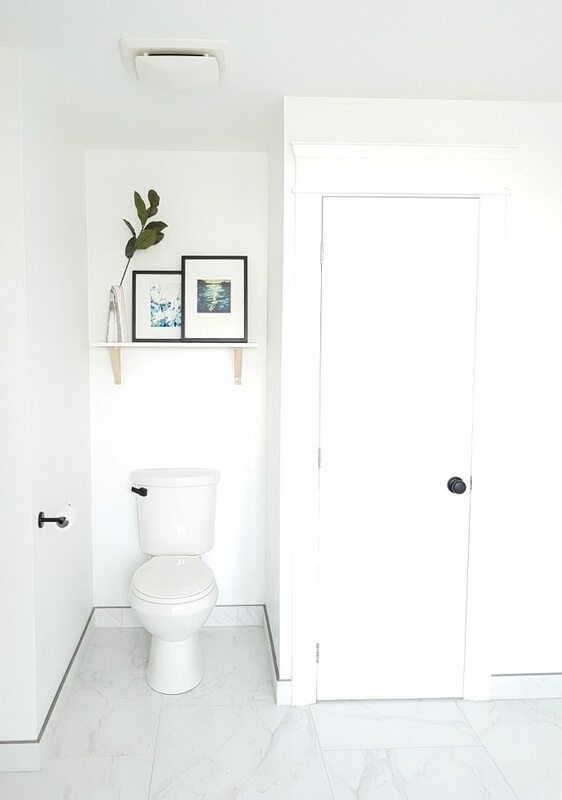 Above the toilet, we installed a shelf from IKEA with brackets in the same blond wood echoed elsewhere in the room. A few pieces of leaning art and some faux greenery. 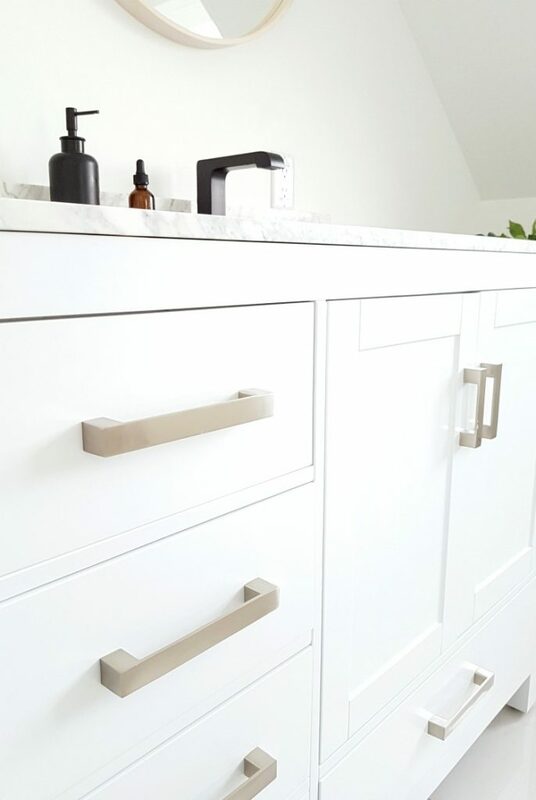 The matte black was carried through with the door handles, toilet roll holder and even the toilet flusher (like the faucets, all were from the Delta Faucet ‘Ara’ collection). The best thing about using a whole collection like we have done with Delta, is that the look is carried seamlessly throughout the room. It all looks so tailored. 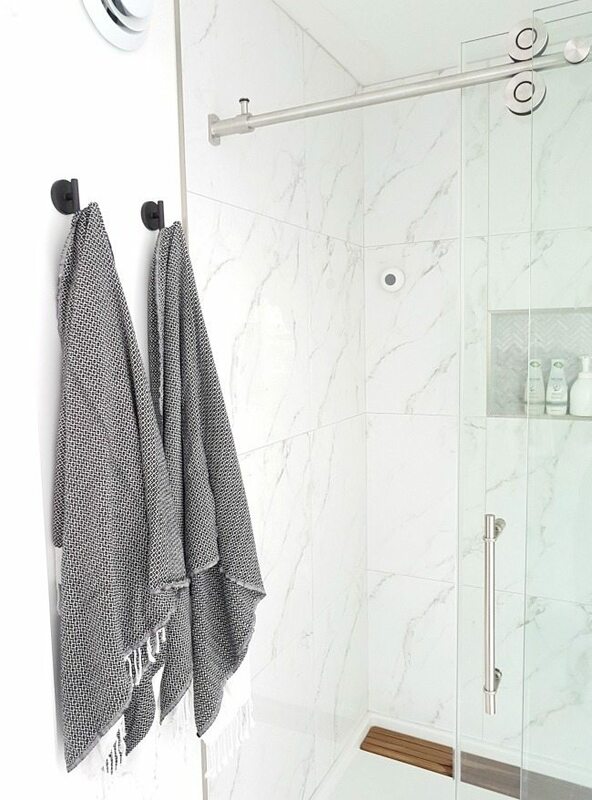 Over to the freestanding shower, we carried the same oversized tiles throughout and again went with the Delta Faucet ‘Ara’ collection. That shower head legit makes us feel like we live in a hotel. It’s SO nice!! 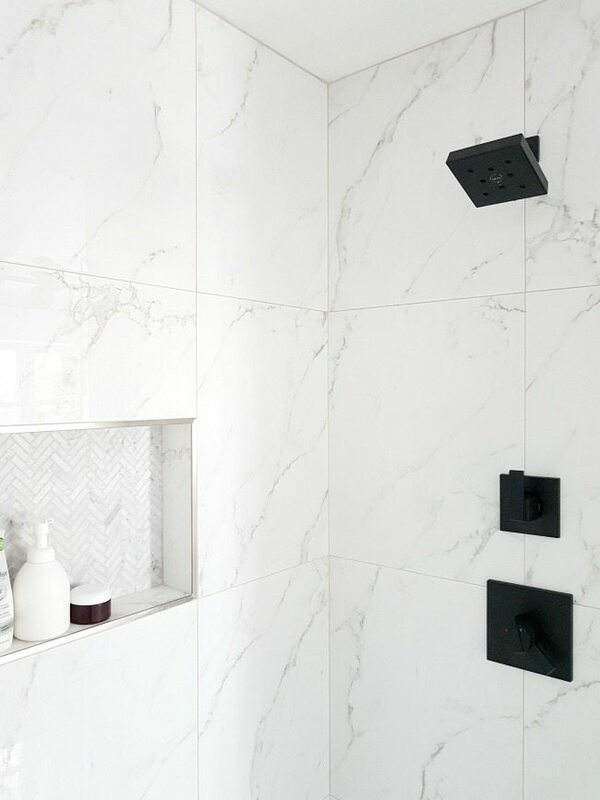 And the niche is my usual trick of using a pricier tile (in this case a marble herringbone) within the niche, and having a more budget friendly choice in the main part of the shower. 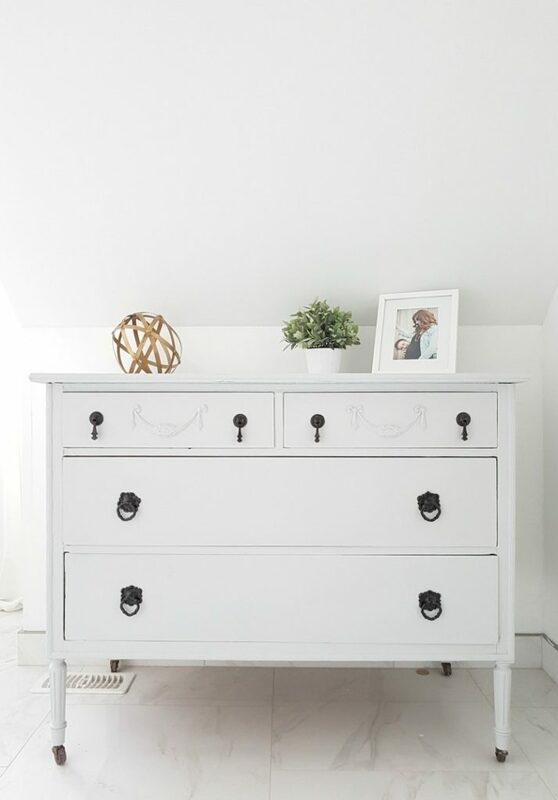 Adding in an antique piece of furniture into the room (scored for cheap!) – that I painted with Fusion Mineral paint – gives the room a bit more of a home-y feel. 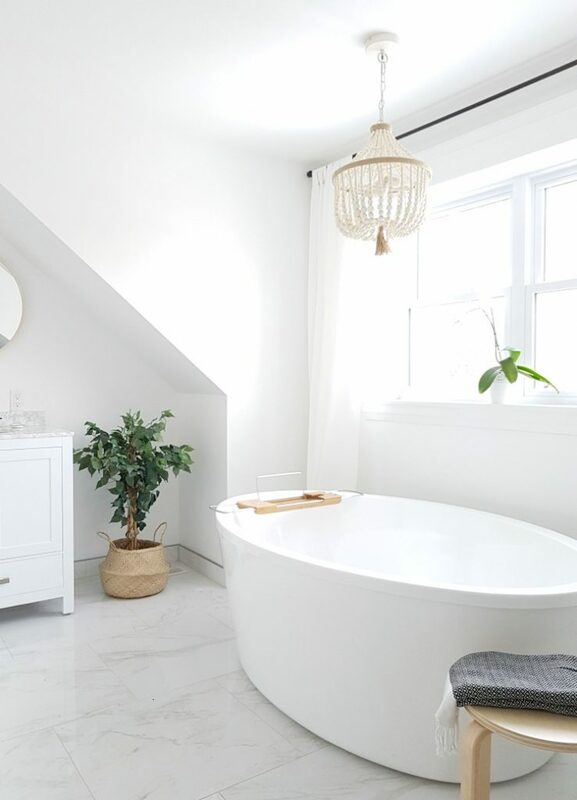 And of course layering in beautiful lighting, window treatments, plants, and accessories finishes off any space. None of these have to be expensive. You can get that high end look on a budget. Check out all the sources below! 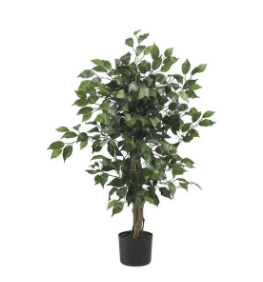 Want to get the look? Here are all the room sources (some links are affiliate). Want to catch up on some of the posts you may have missed in this series? Here they are! And that’s a wrap! It only took us two years… ha! 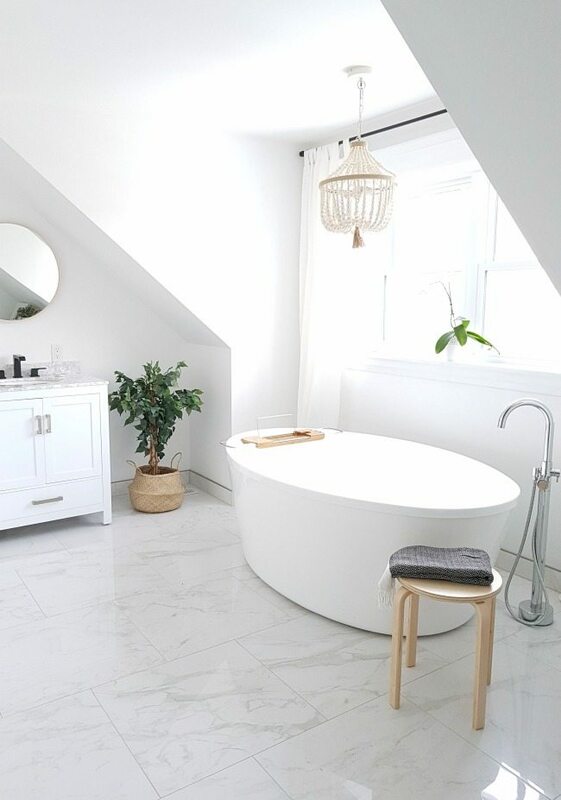 A big thank you to the brands who collaborated with us on this bathroom: The Home Depot and Delta Faucets. We love both of these companies and can’t recommend them enough!